Trailer lights with a 4 way flat connection allow basic hookup for three lighting functions; right turn signal / stop light (green), left turn signal / stop light (yellow), taillight / license / rear center and side markers (brown) and a trailer ground wire (white). 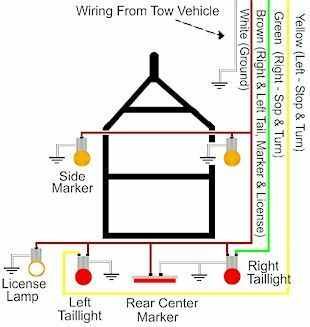 See; Trailer wiring diagram. The white wire or ground wire can be attached to a metal trailer frame and the frame can be used for the common / ground or the white wire / ground can be run to each individual lamp assembly. Use waterproof electrical connectors and heat shrink tube / conduit whenever possible to protect trailer wiring from shorts and corrosion. Standard or submersible lamps. Incandescent bulbs or LED lights. These basic trailer wiring electrical connections are used on car, boat and utility trailers.